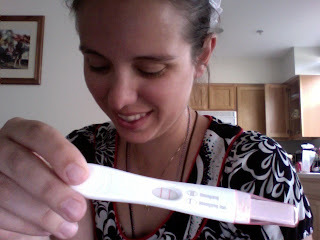 Earlier this week I took a pregnancy test and it came back positive. I danced around and ran out to tell Paul. I was pretty much on cloud nine for several hours. Then for some reason (mostly my addiction to seeing that little double line positive sign) I decided to take another. It was negative. And another, which showed one little line. And then one more, just in case there was something wrong with the other two, because let's face it, I was still in denial and pretty certain that that first test had been right. A few online friends pointed out that posters had said in the review section for the cheapie Amazon HCG tests that they were getting false positives with certain batches. So I guess I can say I now have had a false positive from the cheapie tests. Sigh. Don't get me wrong, I still think they're worth buying. When I went to Walgreen's yesterday to buy every single cough/flu product I could find (as of this morning every person in our home is sick... I was the last to fall... waking up sick this morning...) the average pregnancy test was around $8 per test. On amazon you pay $9 for 50. And out of the 100 or so (a conservative estimate) tests I've taken in the past year (the vast majority were when I was waiting for the tests to go negative the three months after the miscarriage) 99% have been accurate. But I do think it's important to keep in mind that there's apparently a higher chance of false positives with them than with the pricer tests. The solution to this is to make sure to test a second time immediately if you do get a positive, hopefully while managing not to be hopeful or happy, so that those hopes aren't squashed if it is a test error. Ah well. Sadie was wrong. I tested after she said: "Mommy, you're tummy is looking bigger. Do you think there's a baby in there?" Wishful thinking, combined with pre-schooler honesty. I do have to laugh at her frequent evaluating glances at my tummy. Now if only I could get her to keep certain thoughts to herself! Aw...sorry you got a false positive! That hasn't ever happened to me...but I can totally imagine how it would feel. :( I have used the same brand of preg tests that you're holding in the picture, and I think at Target or Kroger they're like $14 for 3 (usually the box says "3 tests for the price of 2" or something like that). Bummer! I'm sure you'll get a "true" positive soon! that stinks when that happens. **sigh** hopefully the signs will change soon! I'm so sorry. I'm sure, in God's time, you will be blessed again. Hope there are no more false test results. What Katherine says. You and your family are always in my prayers.